Rare Rainbow Types. Nature's Beauty! Okologorizontalnaya arc. Known as "fiery rainbow." 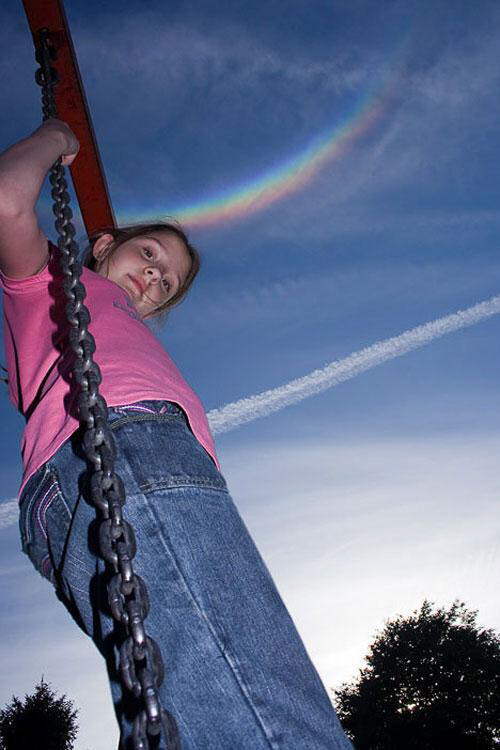 Colored bands arise directly to the sky as a result of light passing through ice crystals in cirrus clouds covering the sky "rainbow film." 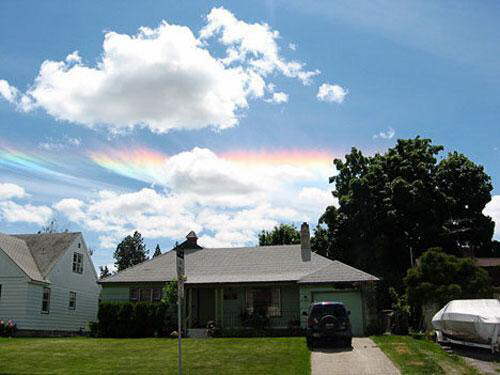 This natural phenomenon is very difficult to see, as well as ice crystals, and sunlight must be at a certain angle to each other to create the effect of "fire rainbow". "The Phantom of Brokkena." In some parts of the Earth can be observed a surprising phenomenon: a man standing on a hill or mountain, behind which rises or the sun, discovers that his shadow, upavshaya the clouds, it becomes implausible great. This is because that tiny droplets of mist special bends and reflect sunlight. His name phenomenon has been named tops Brokken in Germany, where, because of the frequent fogs, you can regularly observe this effect. Okolozenitnaya arc. Okolozenitnaya arc - this arc with the center at zenith, which is located above the Sun by about 46 °. It is seen rarely and only for a few minutes, has vivid color, shape and always parallel to the horizon. An outside observer, she recalled the smile Cheshirskogo Kota or inverted rainbow. "Misty" rainbow. Misty halo like a colorless rainbow. As usual rainbow, the halo formed by the refraction of light through the water crystals. 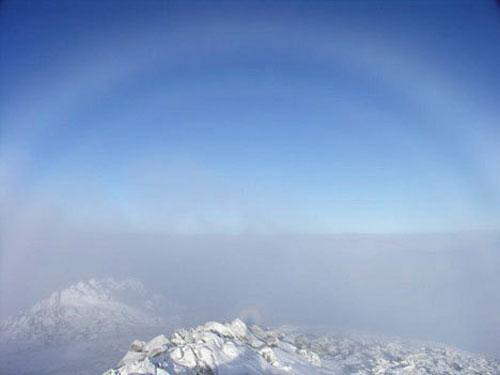 However, unlike the cloud, forming a normal rainbow, fog, bearing this halo, is made up of smaller particles oxen, and light prelomlyayas in tiny droplet does not splash it. Gloria. 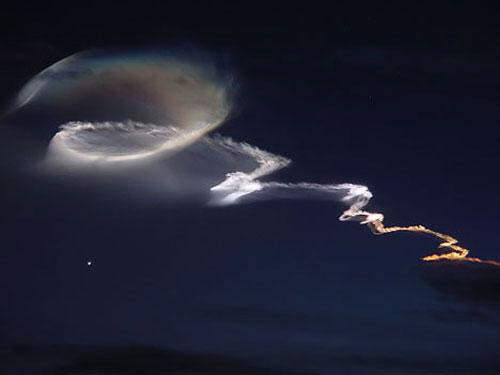 When exposed to light scattering effect of a (diffraction of light, previously reflected in the water crystal clouds), he came back from the clouds in the same direction, which fell, and an effect known as "Gloria". 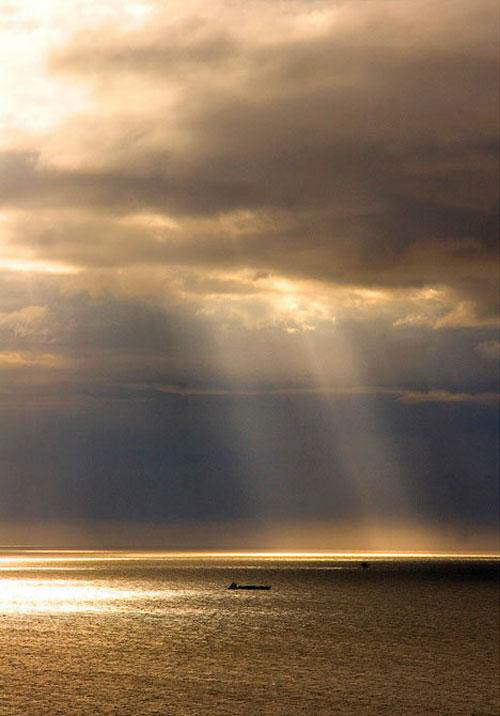 This effect can be observed only in the clouds, which are located directly in front of the viewer or below it, at a point which lies on the opposite side of the light source. Thus, Gloria can only be seen from the mountain or from the aircraft, with light sources (sun or the moon) must be located directly behind the observer. 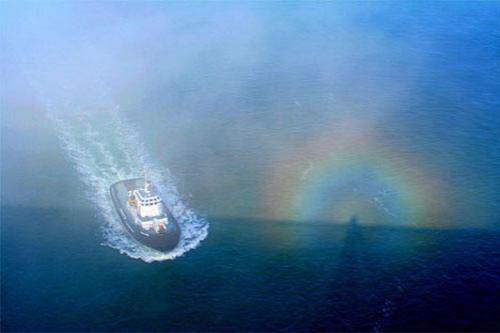 Gloria bright circles in China is also called Buddha's Light.For this photo beautiful rainbow halo surrounds the shadow of air balls, fallen to below a cloud. Galo at 22?. White light circle around the sun or the moon, which arise as a result of refraction and reflection of light in the atmosphere are crystals of ice or snow, called halo. 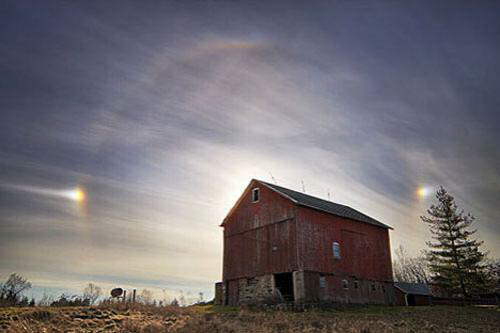 In the present atmosphere of small crystals of water, and when they form a right angle brink of a plane passing through the sun, the one who observes the effect, and the crystals in the sky becomes visible characteristic white halo surrounding the sun. So the verge reflect the rays of light within a 22 °, forming a halo. In the cold season halo formed crystals of ice and snow on the ground reflects sunlight and scatters it in different directions, forming effect called "diamond dust". Brighter clouds. 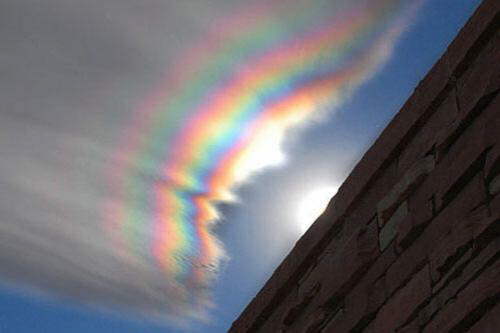 When the sun is under a certain angle to a drop of water that make up the cloud, the droplets bends sunlight and create unusual effects of "rainbow cloud", okrashivaya it in all the colors of the rainbow. His colors are clouds and a rainbow, are required to varying wavelengths of light. Moon arc. 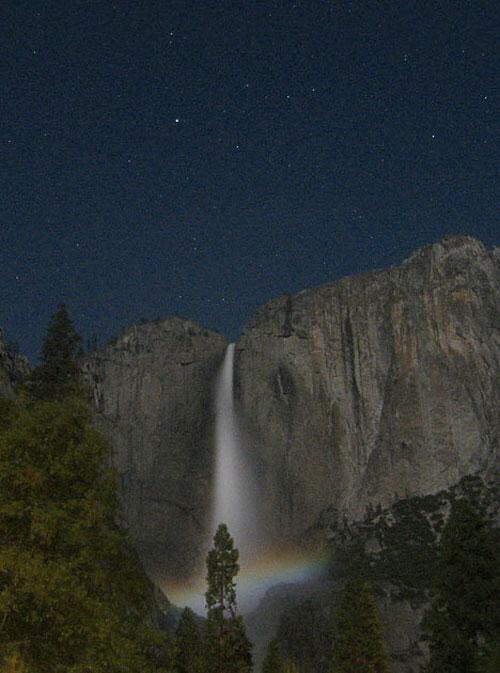 A dark night sky and bright moon light often give rise to a phenomenon called "lunar rainbow" - a rainbow appearing in the light of the moon. Such a rainbow located on the opposite side of the moon nebosvoda and often seem to be completely white. 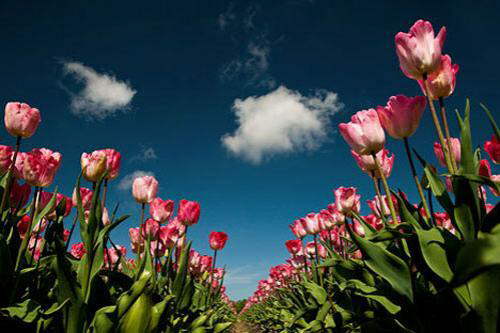 However, sometimes they can be seen in all beauty. Parhelion. "Pargely" in the translation from Greek - "mock sun". This is one way halo (see paragraph 6): in heaven there is one or more additional images of the Sun, located at the same height above the horizon as the sun now. Millions of ice crystals with a vertical surface, reflecting the sun, and formed this beautiful phenomenon. Rainbow - the most beautiful meteor. Rainbow can take many forms, common to them is a rule of color - in the sequence of the spectrum (red, orange, yellow, green, blue, blue, violet). A rainbow can be seen when the sun illuminates part of the sky and the air is saturated with moisture kapelkami, for example, during or immediately after rain. 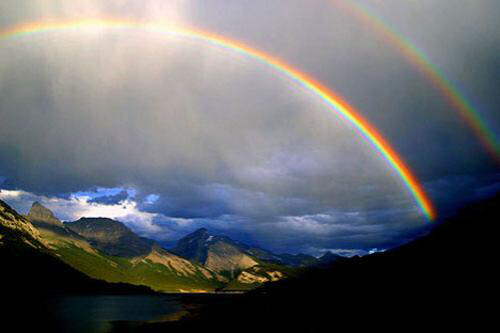 In ancient times the emergence of the rainbow in the sky attached mystical meaning. To see the rainbow was considered a good omen, to travel or go under it sulilo happiness and success. A double rainbow, as they say, brings good luck and desire to perform. The ancient Greeks believed that the rainbow - is a bridge to heaven, and the Irish felt that at the other end of the rainbow is the legendary gold Leprechaun. North siyanie.Svechenie observed in the sky in the polar areas, known as the northern or auroral as well as the South - the southern hemisphere). It is anticipated that this phenomenon exists also in the atmospheres of other planets such as Venus. The nature and origin of auroral - the subject of intensive research, and in this regard have been developed many theories. 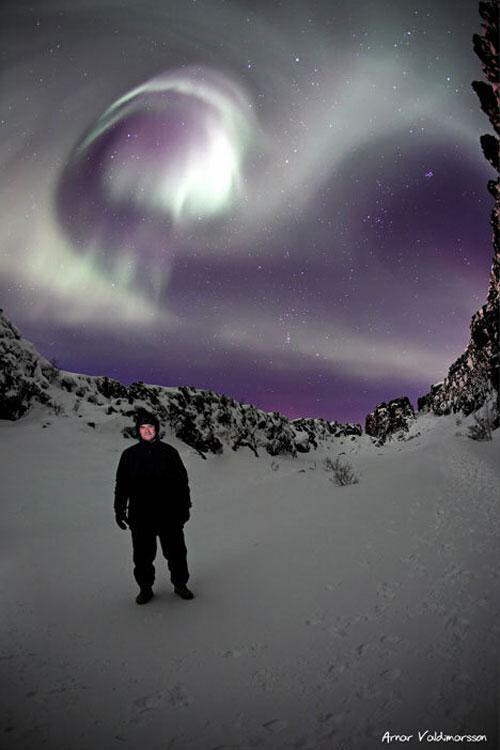 "Polar Lights, as scientists believe, result from the bombing of the upper atmosphere by charged particles moving to the land along the power lines of the geomagnetic field from the adjacent space, called plasma layer. Projection plasma layer along the geomagnetic power lines on the Earth's atmosphere is in the form of rings surrounding the northern meters south magnetic poles (auroral Ovaly). Kondensatsionny (inversion) mark. Condensation should - this white stripes left by aircraft in the sky. By its very nature, they are skondensirovannym mist, consisting of moisture, which is in the atmosphere and exhaust from the engines. Most often, these tracks short - under the influence of high temperatures, they simply evaporate. However, some of them down in the lower atmosphere, forming cirrus clouds. 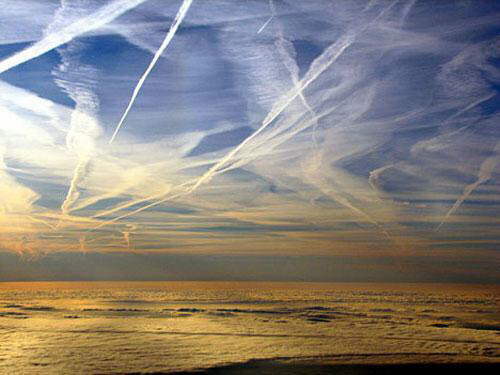 Environmentalists believe that transformed thus condensing traces of the aircraft have a negative impact on the climate.Thin high-altitude cirrus clouds, which are derived from modified aircraft from attack by hinder the passage of sunlight and consequently lower the temperature of the planet, unlike ordinary cirrus clouds, which can retain heat the earth. Next exhaust gas flares. Air flow in the high atmosphere distort inversion traces of space rockets and pieces of the exhaust gases bends sunlight and colors in all traces of the color of the rainbow. Huge colored curls stretch for several kilometers across the sky before evaporate. Pol. Polarization - is the focus of electromagnetic light wave oscillations in space. The polarization of light occurs when light under a certain angle falls on the surface, affects and is becoming polarized. Polarized light is also freely distributed in space, like a normal sunlight, but the human eye, usually unable to capture the changing colors as a result of increasing polarization effects. This image provided by wide-angle lens with a polarization filter shows an intense blue sky attached electromagnetic charge. Such a sky we can see only through a filter camera. Star scent. Hidden naked eye "star trail" can capture on camera. This photograph was taken at night, using cameras mounted on a tripod, with a fully open lens aperture and over time extract. 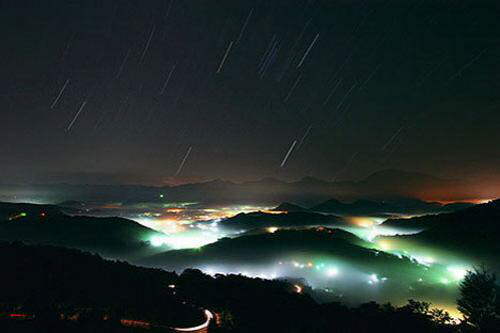 The photo shows the "movement" sky - a natural change of the Earth as a result of the rotation makes the stars "move". The only fixed star - Polaris, which indicates the astronomical North Pole. Zodiacal light. Scattered light the night sky, created by sunlight reflected from interplanetary dust particles, called zodiacal light. 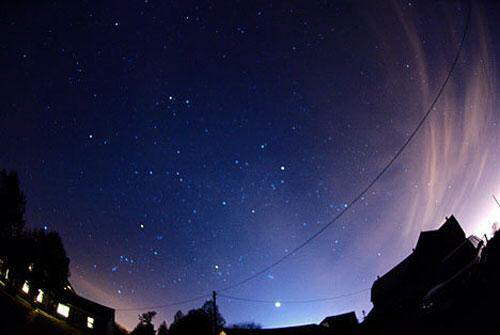 Zodiacal light can be seen evening or morning in the west to the east. 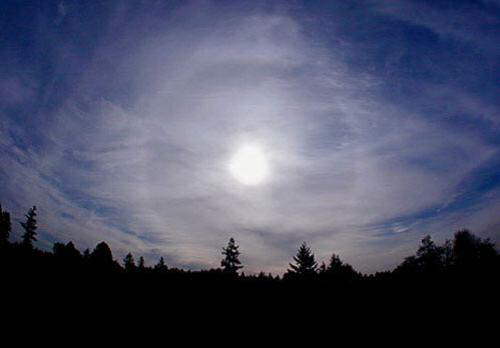 Crown, or crowns - are small colored rings around the Sun, Moon or other bright objects that occur from time to time, when the light source is behind a translucent clouds. Crown occurs when light fine water kapelkami water, forming a cloud. 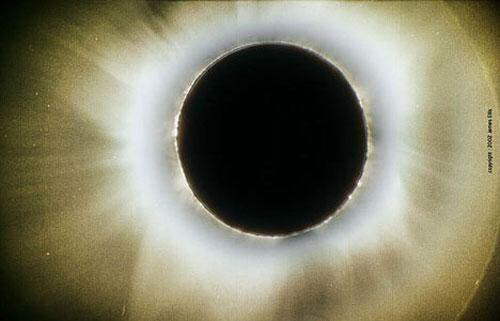 Sometimes the crown looks like a luminous spot (or glory), surrounds the Sun (or Moon), which concludes with red ring. During eclipses the Crown is surrounded by shaded sun. Twilight rays. Twilight rays - divergent beams of sunlight, which become visible through their coverage of the dust in the high layers of atmosphere. 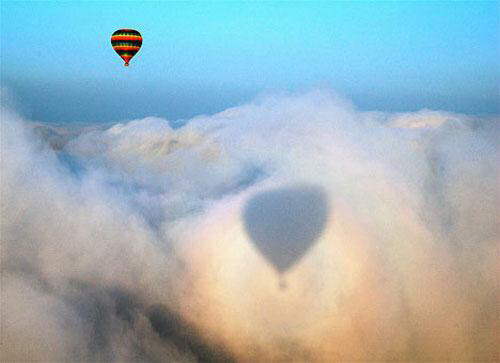 Shadows of clouds form dark stripes, and among them are distributed rays. This effect occurs when the sun is low on the horizon before sunset or after dawn.